As a much needed step towards ensuring women safety in the city, Delhi Police recently launched an emergency service called Himmat. 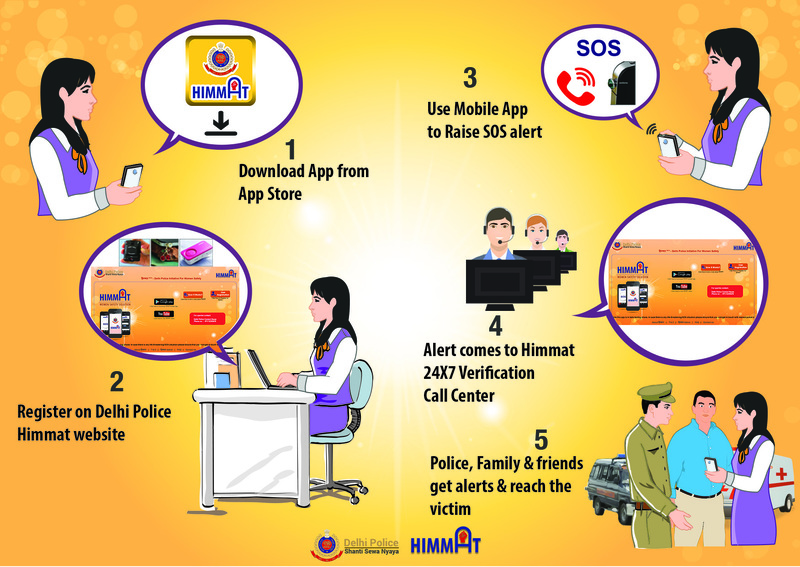 The Himmat android app can send a distress call or emergency message to Delhi Police officials and specified contact or group in an emergency situation faced by a woman. The Police personnel will get these SOS alerts and locations on a portal and as a sms on their mobile phones as well. The call will be responded by central police control room, ITO and Police assistance from control room through PCR Van as well as police station will be extended immediately. 1. By pressing soft button on the app – SOS button sends SOS sms with location to the police numbers configured at the back end and numbers configured in the app as well. This action will also invoke video and audio recording, so the user can record the surroundings. 2. By shaking the phone. The app is a much sought after initiative and has been rated highly by users. Though a preemptive measure would have better served the purpose of women safety, this app at least assures that a distress call can be sent immediately when in trouble and hopefully avoid a mishap. Have you used the Himmat App? Do let us know your views in the comments below. Create similar apps for other Mobile devices also so more women are protected. I hope it’s not just for android devices.